This entry was posted in Media Business Models, The future of news and tagged American journalists, business, journalism, Journalism Revenue, Media, media business, media business models, media companies, media company, Media revenue, news, news industry, revenue, revenue model, The business model. Bookmark the permalink. Hi, Michael. Thanks for an interesting way of thinking about this. In a competitive online news environment, I think it’s pretty difficult to make the reader pay for content. Look at City Business — they’re behind a paywall — but I still see their stuff aggregated elsewhere all the time, or simply re-reported in other outlets. Because they’re a business publication, they probably have a better chance of getting corporate-purchased subscriptions than other media outlets, but I imagine the number of people paying for the content is still pretty low. I actually think some people will pay for the news, however. 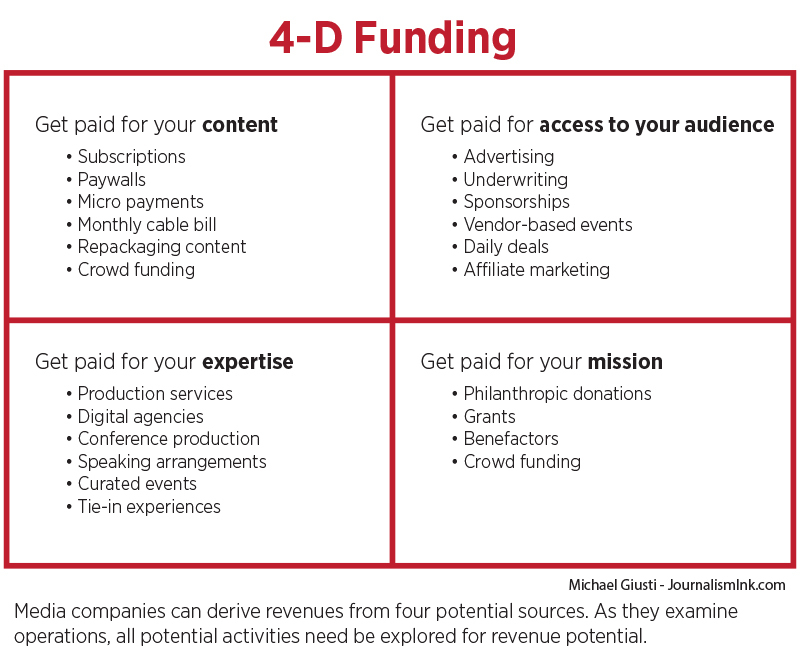 It’s just that this revenue usually is better aligned with the mission dimension than the actual purchasing of content. I think the Lens is a decent model of that, or NPR, but I even think a traditional newspaper subscription is. Anecdotally, people tell me on a regular basis that they’ve always just seen having a newspaper subscription as part of being a good citizen, or part of growing up, or whatever. They’re paying for content — not because they have to — but because they want to. I actually wonder if paying for content is something that other institutions will play a larger role in. A small but significant segment of our revenue comes from our partnership with other outlets, and I could see this working on a number of different scales. I’ve been enjoying the analysis. Keep it coming. Yeah, getting people to pay is the trick, isn’t it? For a lot of today’s business models, free really is the price point (I will talk about that in a few weeks, actually). But I guess my bigger point is that if we are offering it for free, it should be because free is part of our overall strategy, and not out of a knee-jerk or automatic assumption. We should be getting our funding from somewhere else (or preferably, three different places). Free can be justified if it is part of a marketing effort, for example. Free can be justified out of mission. But if we are making a product that people don’t value enough to pay for, then we need to rethink our approach.